This beautiful bai choi features of one standing bai choi surrounding with 8 money frogs and standing on one wooden like stand. Bai choi, which is also known as bok choy, bai chai, is a powerful symbol of wealth and opulence in Chinese art, literature, and culture. One red ribbon tied in front of the white color bai choi statue brings its bright contrast and enhance its beauty of white. The Chinese words in front of the stand have the meanings of "Wealth from 8 different direction". 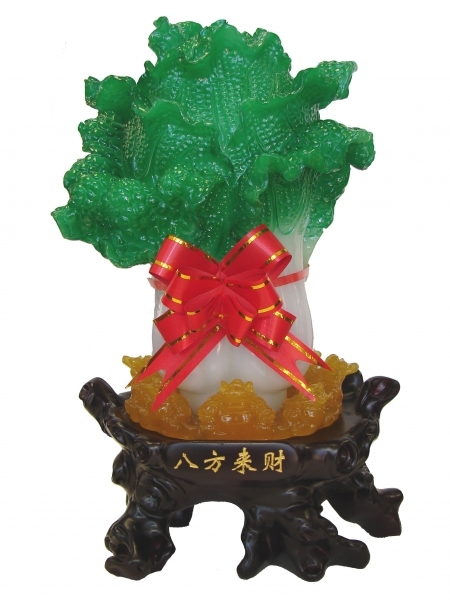 Money frog (money toad) in feng shui is believed that it can bring money luck in. 8 money frogs stands for "Wealth from 8 different direction". Displaying such bai choi statue at home or office have powerful abilities to boost wealth, business luck, and fortune. This dimension of this bok choy statue is aprpox. 8" (L) x 7" (W) x 14" (H). It is made of polyresin.